Discussion in 'Beginners' started by Jezston, 18 May 2010. No I'm not buying him one, I'm not THAT much of a fawning sycophant! But my boss is keen on cycling to work at least a couple of days a week but has no idea what kind of thing to get. Recommend he goes to the LBS near work and have a chat with them and try some out, and I've suggested he checks out touring bikes. If anyone has any recommendations and things to consider, not just in terms of bike but also accessories, riding tips etc please share so I can encourage him! - Journey is a newbie-dawnting 17 miles each way. Relatively flat and mostly country roads, but starts with a steep uphill for almost a mile. - Boss is about 40, seems in fairly ok shape for his age, but does have lower back problems. - He'll be bringing change of clothes and perhaps a few other bits and bobs. - Probably only doing a couple of days a week to start, and doesn't fancy it in winter. We need to encourage more! - Work has cycle to work schemes available, but part of reasoning is to save money so may be hard to convince them to pay too much. I'm thinking £600-700 max perhaps. Good if something nice could be bought for less. He should try several, and if he has back problems a good lbs sounds an excellent starting point. With back problems he should think carefully about whether to use panniers rather than a rucksack. A tourer would carry his clothes etc, but so would a good hybrid type bike, which as a novice he might prefer. (Drops on a tourer might not be to his taste). Depends what your boss is like. If he's a dragon, get him the cheapest, heaviest BSO and watch him suffer. Tell him how much you saved him whilst secretly rejoicing in his physical pain. Keep reminding him that the pain is normal in the first few months. If he's a dream boss, then suggest the best bike for his terrain / fitness level / budget. Then when he's bitten the bug, go on weekend rides with him, stop at some pubs/cafes and become best mates. This will lead to an automatic promotion. Let him borrow yours - then, of course, you'll need something else. Heh, no he's a good guy so I want him to get something good. 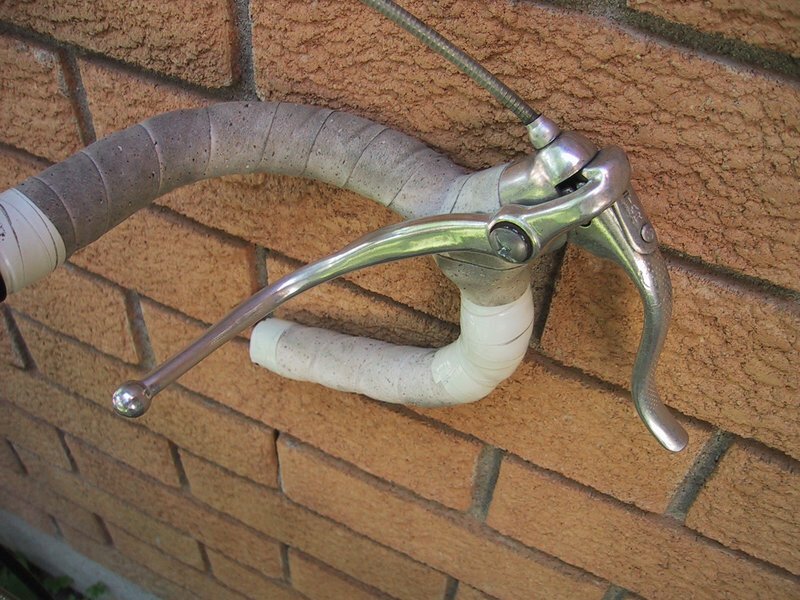 Was thinking flat handlebars would not be recommended due to the long ride. A tourer with drops and those little brakes on the flat part of the bar I reckon would be good so he can hang around there while he's getting used to it whilst having the option to move his hands around when he gets uncomfortable. Panniers definitely over rucksack, but I suppose those could be fitted to bikes other than just tourers. Interruptor or cross brake-levers I think they're called. I thought there were called suicide levers! (or are they better these days?). No - better now apparently. Oh, those look quite good... Thanks for the pointer. Dawes Karakum; comes with a rack for luggage, and butterfly bars to help with the back pain. Flat bar might be better, if he has a bad back the drops could be uncomfortable. If he doesn't mind looking like a looney he could try butterfly bars which give a good range of hand positioning. Hmm, boss is unsure of his total budget having considered the cost of all the extras he'll need (pannier bags, lights, clothes etc). We saw this one at the local bike shop (who annoyingly don't stock touring bikes) which looks like it might do, if possibly being a bit heavy and clunky.